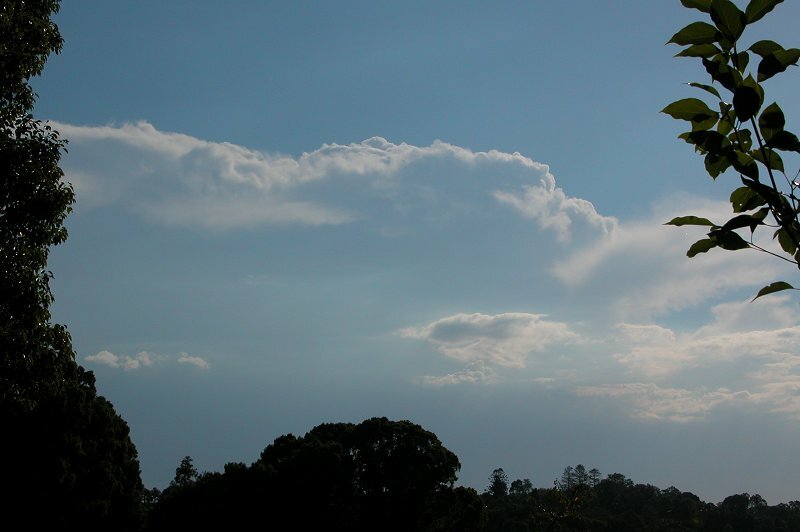 The day was looking pretty marginal with weak instability and fairly slack mid-upper level shear. The moisture profile was ok, with adequate moisture from the surface till 600mb and then mostly dry above that and a cap was expected to hold activity down till a little later which suited us well! Skies were clear during the morning, with some small but crisp Cjs developing on the ranges to our NW and W during the early afternoon. 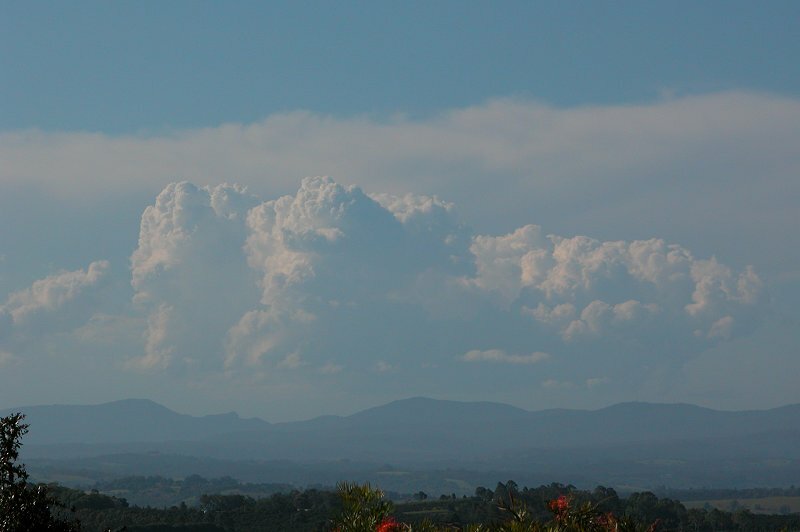 Weak cells developed around 1.40pm in the Dorrigo region and continued to develop and weaken (pulse storms) during the afternoon. Nothing substantial had really taken off. 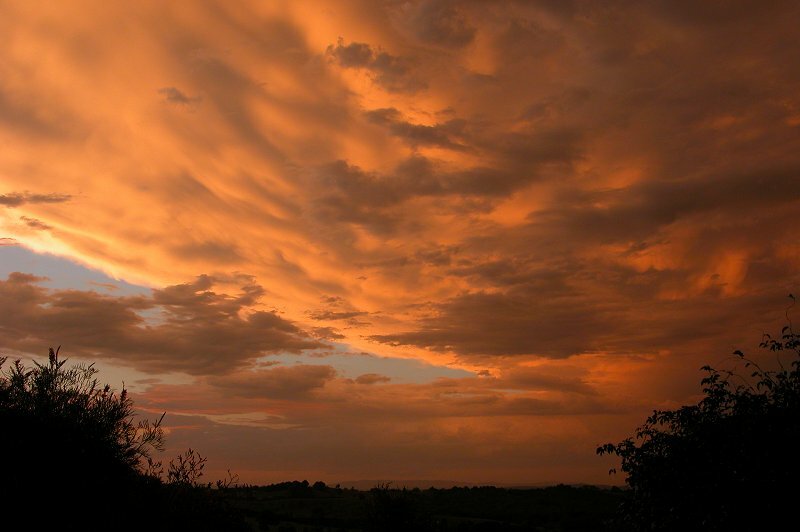 Development was gradually advancing from the SW though, and cells were visible from my home. 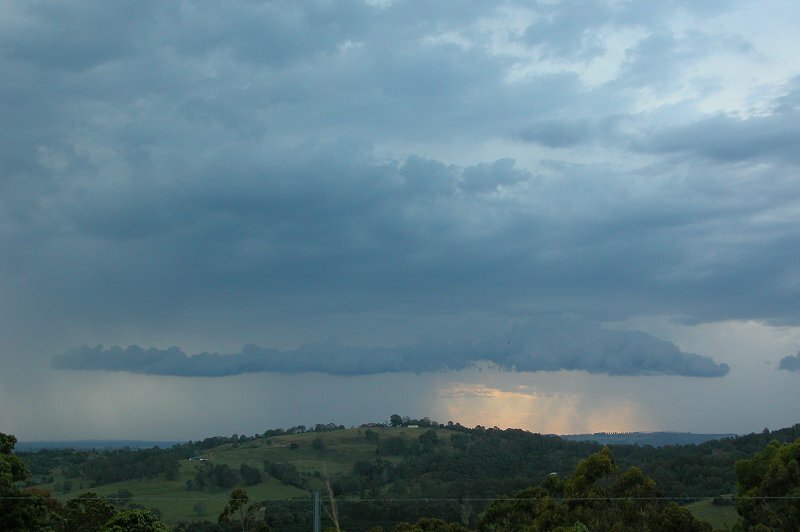 A cell that developed on the Border Ranges to my NW was also visible. By 3.50pm a cell that was heading generally NNE towards the Casino area that I was keeping my eye on had dramatically weakened on radar. Visually the cell also looked weak. From this point the radar went down until 4.25pm. This was frustrating as I didn’t notice its re-intensification until the radar came back briefly at 4.25pm. It was now a solid line of yellow and green and when I went to get a visual there were two large updrafts pushing through the anvil. It still didn’t look overly strong though. At 4.50pm when a new radar image came though it was clear the cell was now strengthening, and base features were becoming visible from my location. Michael Bath and I decided we’d meet up at Tregeagle. I was out the door immediately and whilst driving out realised the storm had a guster on it, however this weakened as I got to the target location and became detached. 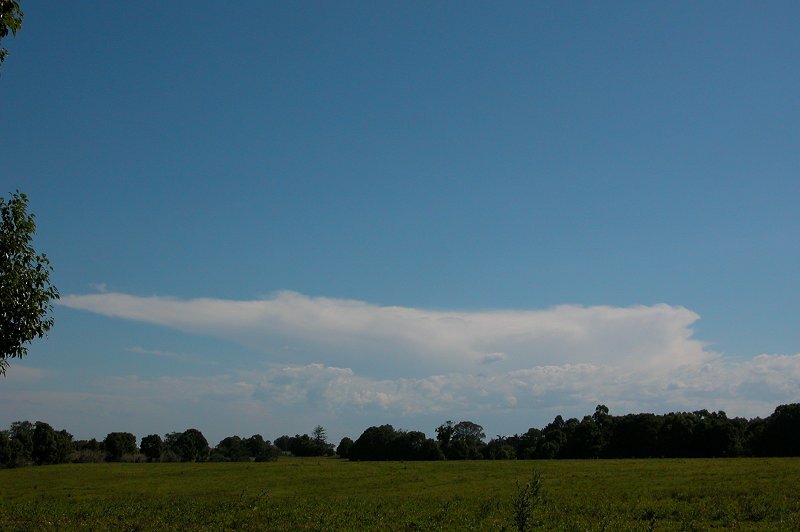 The cell did have a solid anvil that was fairly high toped which was nice and it was dropping some CGs. 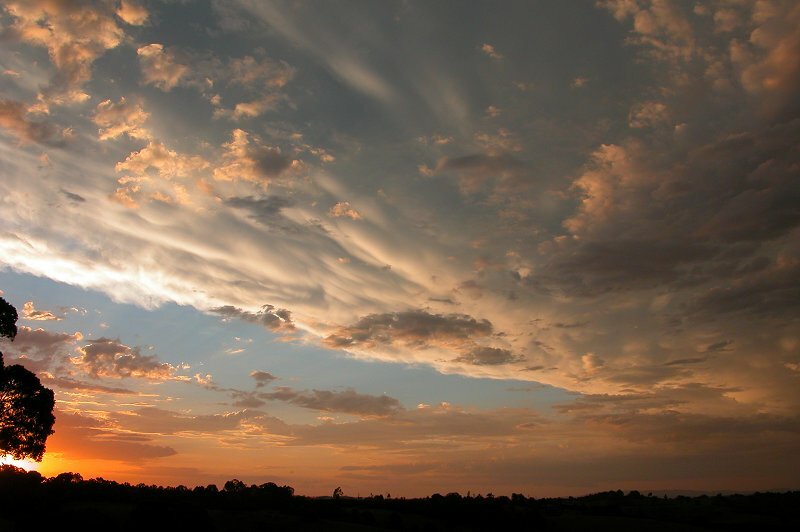 We watched for a while as a rain free area developed on its SE side. With precipitation now appearing heavier around the Casino area we decided to head towards the cell in the hope of getting into to! 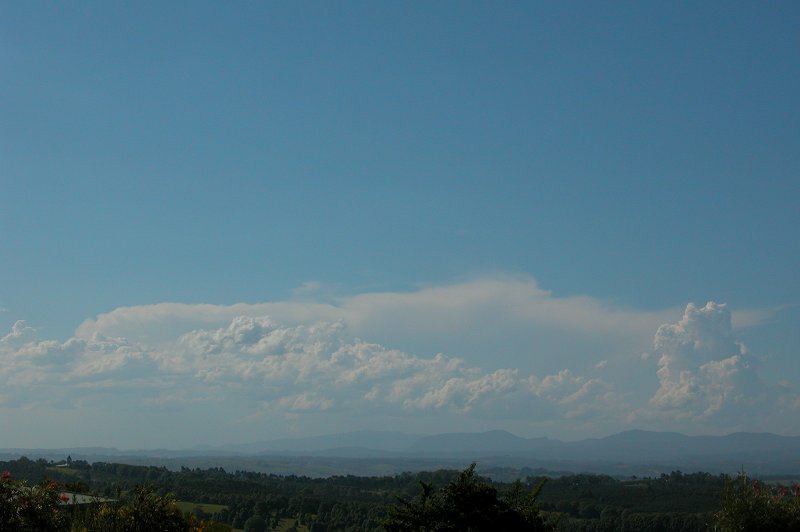 It also appeared that the cell was developing on its NW flank. We stopped about 14km N of Coraki to quickly have a look at what was going on. 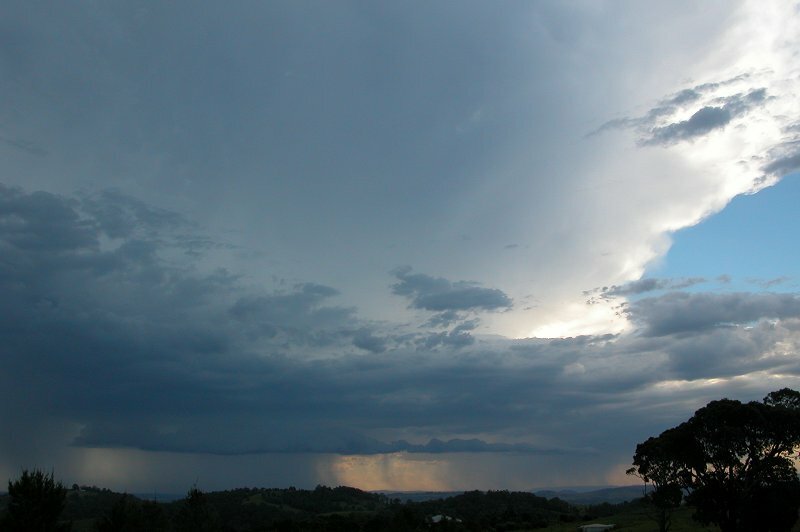 The rain ahead of us had now weakened, however towards the NW the precipitation was looking quite intense. 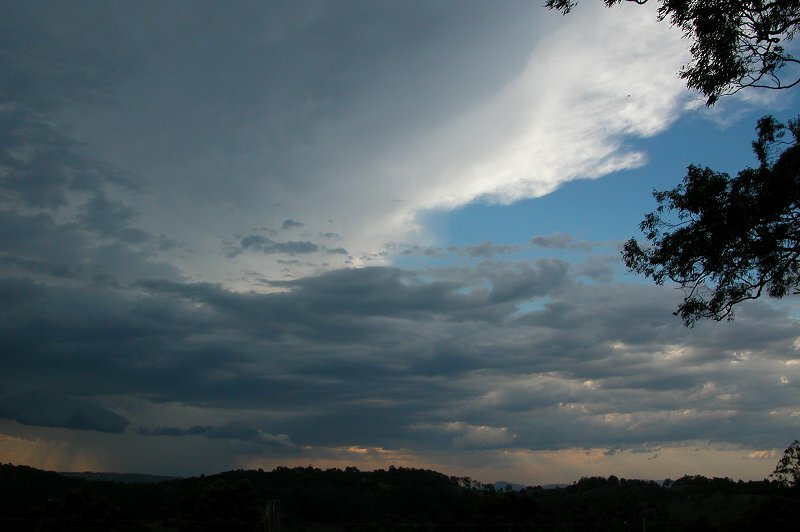 After admiring the lovely thick anvil we headed of towards Kyogle on the Lismore-Kyogle road. 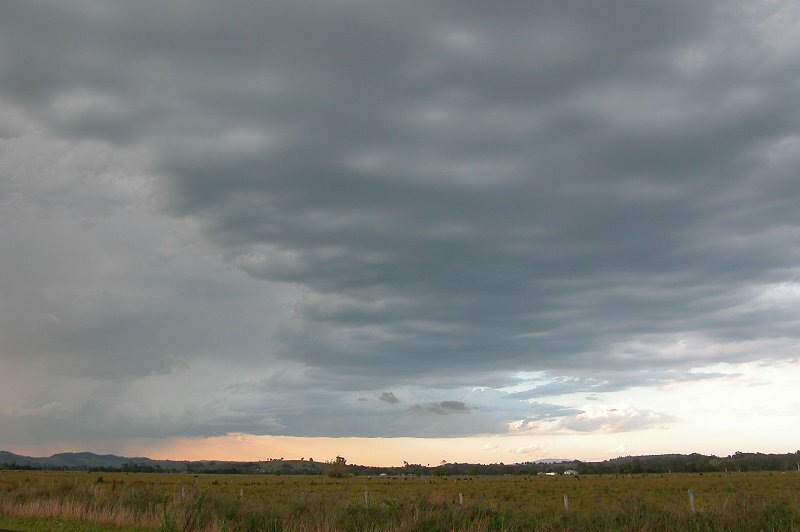 Several nice CGs were observed on the trip out, and it was obvious that a guster was developing on the now severe cell. We stopped at the turnoff to Casino however, as the cell had gotten away on us! We stayed for a little bit to enjoy the lightning from the cell before anvil rain enticed us to head back home. 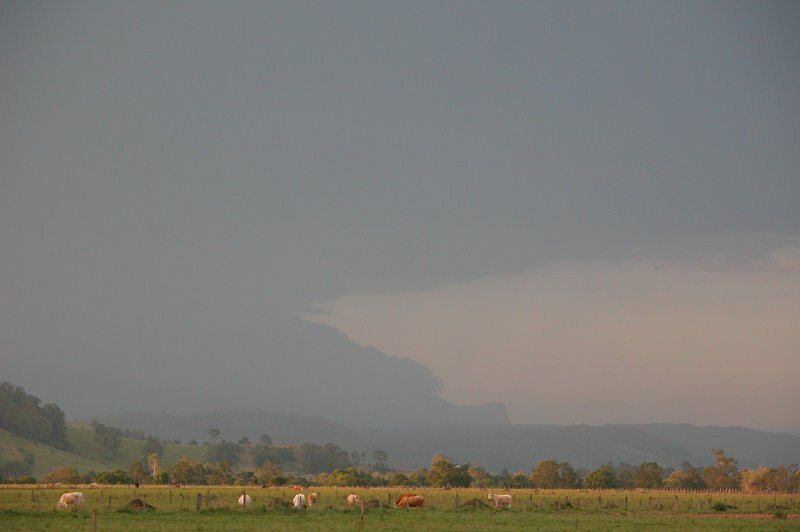 On the way back I stopped briefly to photograph what appeared to be the large guster on the cell. It was disappointing it hadn’t done this S of Casino! 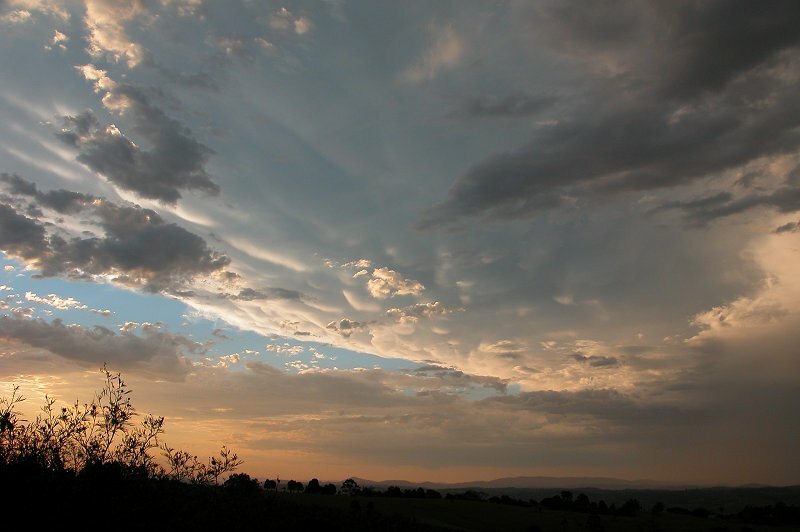 Just outside of Goonellabah on the trip home I spotted some mammatus from the Kyogle cell out of the corner of my eye and quickly pulled over. 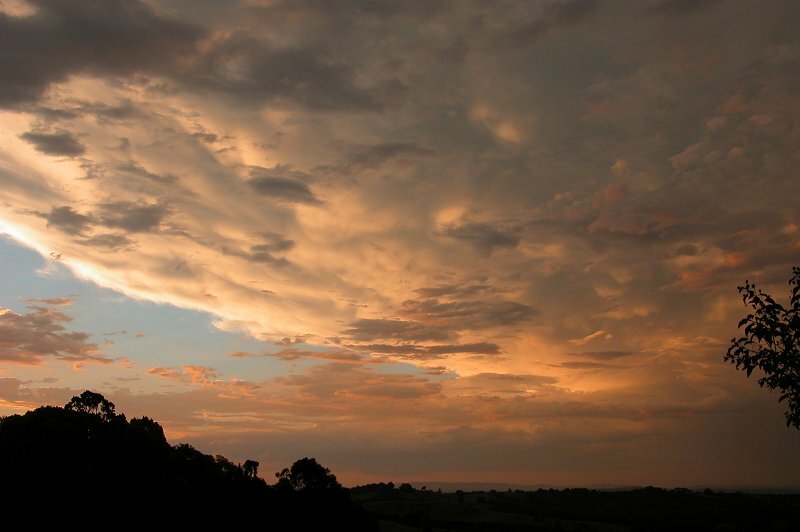 The storm had a lovely backsheared anvil with mammatus that was brilliantly illuminated by the lowered sun. 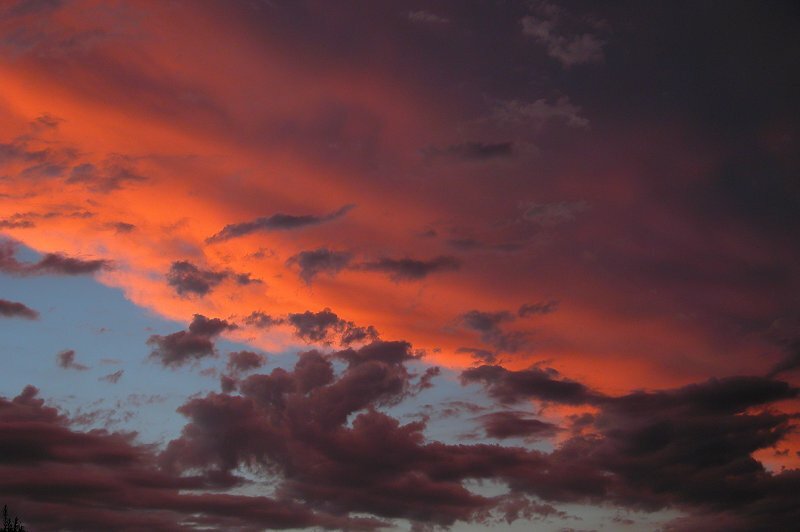 I took a few photos before racing back home to photograph it as the sun set. A perfect way to end the chase! 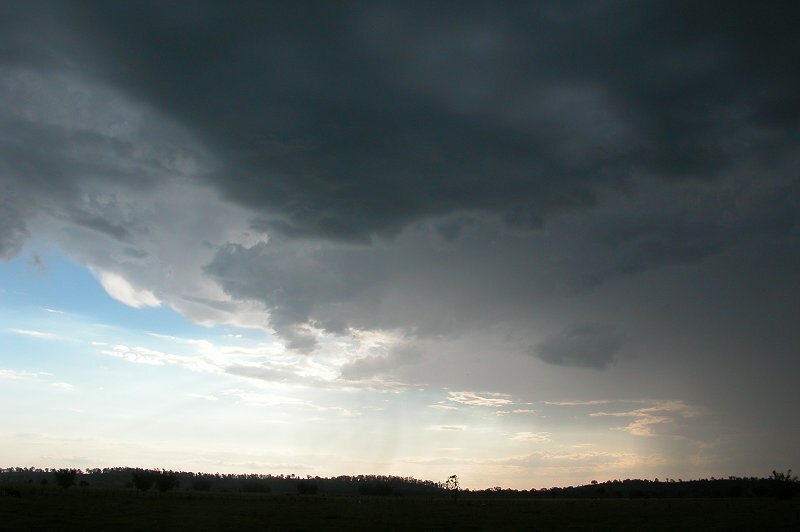 The storm weakened as it crossed into Queensland, however some lightning was observed at dusk. 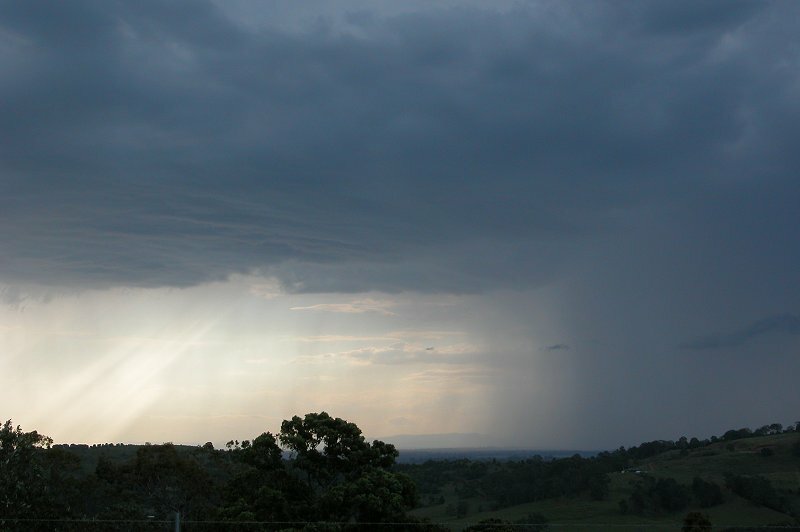 The storm had caused some damage when it hit Kyogle, blowing out some windows at a home and knocking an old church building off its foundations!